Last weekend, I was filling my instagram feed, with pictures from my trip to Palm Springs. Every year, D and I head south to warmer weather in February. Last year we headed to Las Vegas. This year, we chose Palm Springs. There will be more trip details to come, but today I want to talk about a Palm Springs packing list. Every person has some special requirements they like to bring while traveling. I always like to bring 1 extra set of clothes in my carry-on just in case luggage gets lost. I also will bring extra camera equipment depending on the location. Tailor this list to best fit your needs. 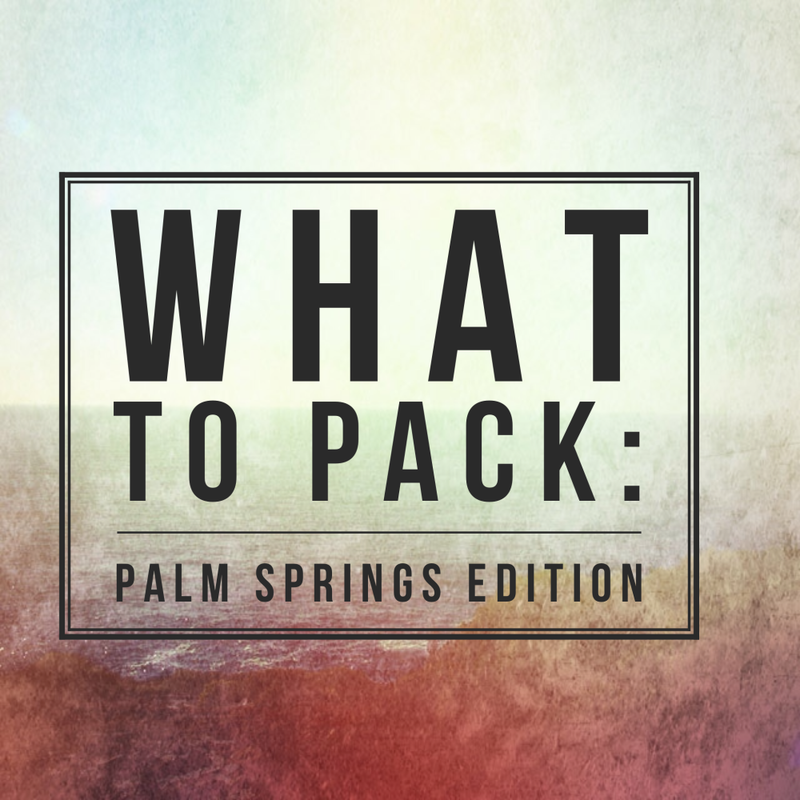 Overall, it’s a great foundation for a Palm Springs packing list. Stay tuned for more trip details! The photos from Palm Springs looked incredibly relaxing and beautiful – can’t wait to see how it recharged you! And that swimsuit is so cute!!! I’m one of those odd people who absolutely loves making packing lists, so obviously I love this! Palm Springs is so perfect this time of year! We had a perfect time! I used to live in Palm Spring in the late 80’s (now I’m telling my age) It was a fun and exciting place! Hope you had a chance to ride the tram…it’s beautiful up in the mountains!! Have a great day! WE did! IT was a great vacation. Love the espadrilles and love Palm Springs. Can’t wait to hear more! My goodness, that swimsuit is too adorable. Also I second your rec to bring lip balm with SPF. So many of us forget, and burnt lips are no fun! This is a great list! I’m a huge advocate of bringing extra clothes in a carry on, or just bringing a carry on. Totally saves your sanity if a flight is delayed or canceled! Cute suit! Great packing list, too. I usually try to fly with just my purse and one carry-on, but when I do have to check a bag for longer travels, I also always pack at least one extra change of clothes in my carry-on. Palm Springs sounds soooo nice right about now! . Great list. I may use it when I travel to Arizona next month. It’s saved me a time or two! Looked like you guys had such a great trip! I was jealous of all your pool time. Glad you had fun!! Awesome detailed list. There’s just something about lists that I love! and I love packing as well but the budget says no to travel for now 🙁 How long were you out there? Great packing list! I’m always trying to make one but there is just so much to remember. So thanks! Great list! We’re heading to Mexico in a week and a half so my packing list will be very similar!